Por favor, lea este – so now what do you do? I am multi-lingual, I speak American, Australian, English and a fair share of Canadian. That being said, when I travel anywhere else in the world I find myself having a bit of a hard time communicating. Whats worse is trying to read signs, especially since they may have something particularly important to say. Well, TGPhoto was launched recently, by LinguaSys, Inc. and it enables users to photograph foreign signs or simple text on their Android and Blackberry devices and get almost instant translation in return. Once you have the TGPhoto application on your Android device, you fill the screen with as much of the foreign text as fits in your viewfinder, take the picture and view the translation. The display will show both the original text and the translation in separate boxes. Users will need to set the languages for both the text to be photographed, and its desired translation. 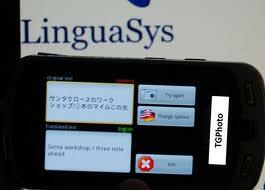 TGPhoto translates over 50 languages on any Android device with a built-in camera, using Android 2.1 or above. The Blackberry version requires Blackberry 5.0 or greater. Available for download now, through the Android marketplace for only $12.99 and of course an iPhone version is coming soon.